I can’t say it enough! 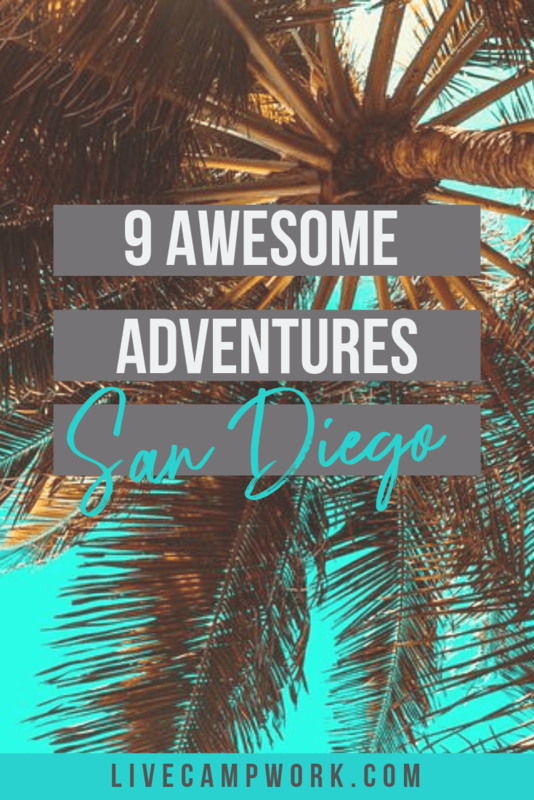 My family had a great time in San Diego and we found a ton of awesome family adventures we wanted to pass along to all of you! 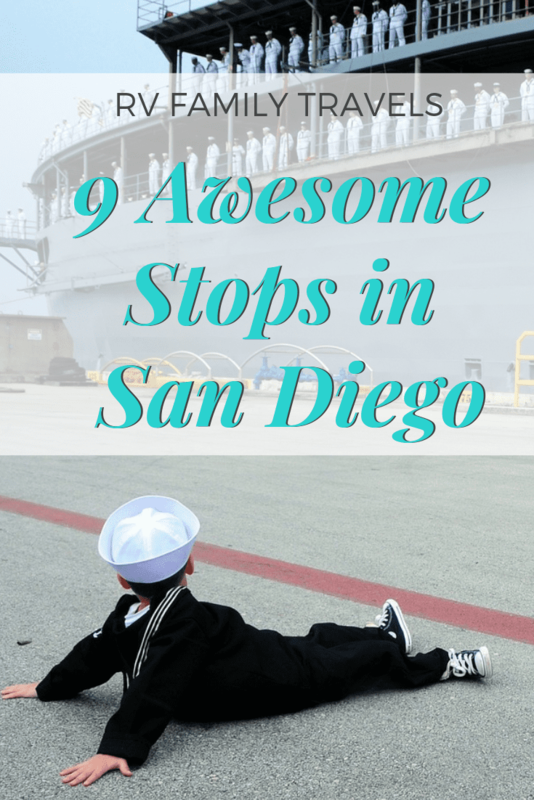 San Diego is full on fun for all ages, and if you have kids in tow, well… there are just some things you won’t want to miss! We spent a few months in the area and felt like we still needed more time, but if you know anything about the Collier Crew you know we travel slowly and we’re never in a hurry!!! With that said, I don’t believe you truly need 3 months to spend in San Diego with your family to enjoy all it has to offer. For the typical traveler who loves to keep busy and experience maybe two or three attractions in one day, a week or two would be plenty. For others, who hit the ground the running and just go go go… 3-5 days will be sufficient. USS Midway: Cheap fun (if you buy on Groupon) and a day well spent with education and entertainment! The kids will love the opportunity to step foot on and below deck of this spectacular navy vessel. We spent 3-4 hours onboard and could have probably stayed at least 1-2 more if we wanted to see every inch. We walked along with the audio tour, skipped the simulators and spent a few moments in the gift shop. If you’ve never been on a vessel of this magnitude, you’ll likely feel just as impressed as the kids! Make sure to wear comfortable shoes and be ready to climb steep steps to access different areas of the ship. Bike Rental Coronado Island: We love renting Surrey Bikes! I know we look silly, all piled onto these 6 seater bicycles, but it makes for some awesome family moments and we love it! We rented a Surrey bike on Coronado Island, after driving over the beautiful bridge! The Fun Wheel Bike Shop was actually located the property of the historic Coronado Hotel, which made it interesting to find, but doable. We used a (Groupon) and were able to snag 2 hours from just $30! We peddled merrily along the streets of Coronado taking in the beautifully ocean views and even hopped off at the request of the kids to go in one of the many open houses, featuring a historic home just listed on the market. Overall, as long you stay on the streets marked as safe on your map, you’ll have a great time! Be prepared with water and some snacks if you have small kids, as this is definitely a work out! Balboa Park: I could live in this park. It’s like Central Park in New York, but better maybe because it’s in San Diego! The park is home to a variety of attractions, like the zoo, museums, art galleries, cafes, and more! You can stroll around and make a day of just sightseeing and hanging out or pick some of the many museums to visit and head indoors on rainy days. The park even has a cool App, which I highly recommend downloading! The Natural History Museum: Located inside Balboa Park this Natural History Museum is different that those we’ve visited in the past. It was less crowded , which we enjoyed, and the entire top floor was all photography… from what we could tell. The kids enjoyed the hands-on exhibits and the interactive scavenger hunts we were able to pick up and drop off. They also had a cool Airstream Camper on display, which was pretty cool to explore! Oceanside Beach: This is like a cool laid back hipster village, nestled on the banks of the Pacific Ocean. We also rented a Surrey bike here, and the experience was quite different than in Coronado! We rode down the ‘Strand’ and then down out on the street for the remainder of our time. Many other families were out and on bikes similar to ours, as well as single ‘go-cart-type’ racers. We enjoyed the street food, and the variety of chores to sample. Parking was free, and the cute cottage type houses right on the ocean seemed perfect placed for photos! We also enjoyed the variety of Kambucha on tap- and settled on the Living Tea House, where we also purchased our own continuous brew system! Seaport Village: If you like to hang out alongside the water with great specialty shops, cute boutiques, tasty food and great brews, Seaport Village is the place for you. From a Cupcake Wars Champion Bakeshop and Ben & Jerrys to $7 1/2 pint glasses and cheesy pizza, this place has all the local favorites plus live entertainment on the weekends! Pour kids really enjoyed watching the show , where a man stalled everything from fire to swords-which was pretty hard to watch for me, so I wondered off into the stores…. bonus! Legoland: My favorite place out of the whole trip, where kids of all ages can enjoy lego themed fun and a trip to the connected aquarium and water parks. Our kids loved it, even the oldest who is 13, and the highlight was being able to trade in their mini figures an unlimited number of times until the settled on their pick of the day! Rides are suitable for all ages groups and parents are able to participate as well. The water park is an additional charge, but the access is within the Legoland park. You can expect a large section of gimmick-games where kids can try to win prizes and dining options to suit every taste! Spanish Village: On our last trip to Balboa Park we stumbled across this special treat for the artist in every family! Spanish Village is a small collective of artists who own/rent space inside the Spanish inspired courtyard to showcase, teach, and/or create their art! We visited about 10 or so shops and the kids were very impressed by the variety of artists ranging from oil pastels to silks and rice paper. SeaWorld: Who can resist a trip to SeaWorld with the family? Even-though we’ve been to SeaWorld many, many, many times in Orlando-visiting the California property was drastically different. Florida was all about big shows and entertainment, while California was more concern on educational features, stories and keeping PETA from protesting… We had a great time, and since we visited during the week , the lines were short and we didn’t have to worry about being crowded. The 3 Biggest Questions Workampers Want to Know!